Charmel Maynard joined the University of Miami in 2016 and currently serves as associate vice president and University treasurer. In this capacity, he leads the University’s efforts to invest assets, including endowment and pension funds. Mr. Maynard is also responsible for the University’s capital structure, including liquidity and debt issuances. Additionally, he manages treasury and cash management. Mr. Maynard was previously a vice president with J.P. Morgan’s Investment Bank in New York City. 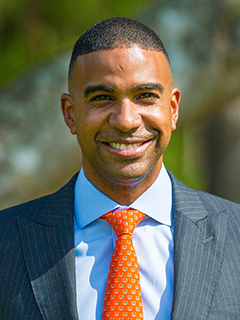 During his 10-year career with J.P. Morgan, he focused on investment banking debt capital markets and leveraged finance, where he advised clients on capital structure solutions, deal structuring, and execution of syndicated revolving credit facilities, institutional term loans, and bond issuances. Mr. Maynard holds a Bachelor of Arts in political science from Amherst College.